What is it to be a doctor? St Luke the Evangelist, whom we are commemorating today, was a doctor: ‘the beloved physician’, ιατρός αγαπητός, according to St Paul in his Letter to the Colossians, [4:14]. He was the author of the Gospel that bears his name, and it looks as though he was the author of the Acts of the Apostles too. Both books are addressed to somebody called Theophilus. It’s quite clear from the beginning of the first chapter of Acts that it is a continuation of the story which was told in Luke’s Gospel. If you look at Acts chapter 16, you’ll see that, all of a sudden, the narrative changes from third-person, ‘they’ did this, that and the other, to ‘we’ did this, that and the other; so it’s pretty clear that Luke was one of the people who actually went around with St Paul. My daughters, Emma and Alice, are both doctors. They’re probably not evangelists as well, like Luke was, but I think they would both say they had their hands pretty full, just being doctors. This weekend doctors are in the news. 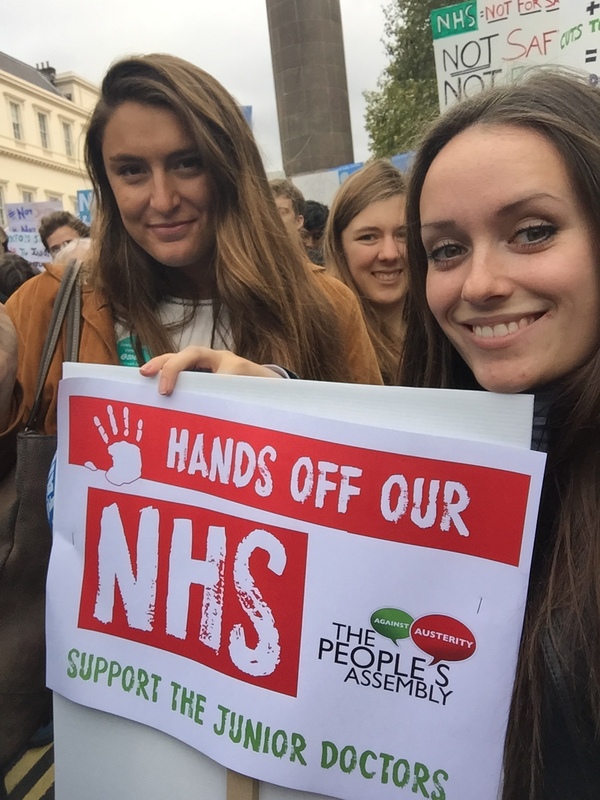 My daughter Alice travelled up from Exeter in order to join yesterday’s demonstration in Parliament Square by thousands of so-called ‘junior’ doctors – because that is what she is. It’s a misleading description. ‘Junior’ doctor, in this context, means any doctor who is not a consultant or GP. But even a really junior ‘junior doctor’ – and I think that Alice, as an F1 hospital doctor (what used to be called a Junior Houseman) would accept that she is one of those – is somebody who has had at least five years of academic study and whose career then goes forward through more or less constant further training until they either become a general practitioner, or a Senior House Officer, Registrar or Consultant in hospital. 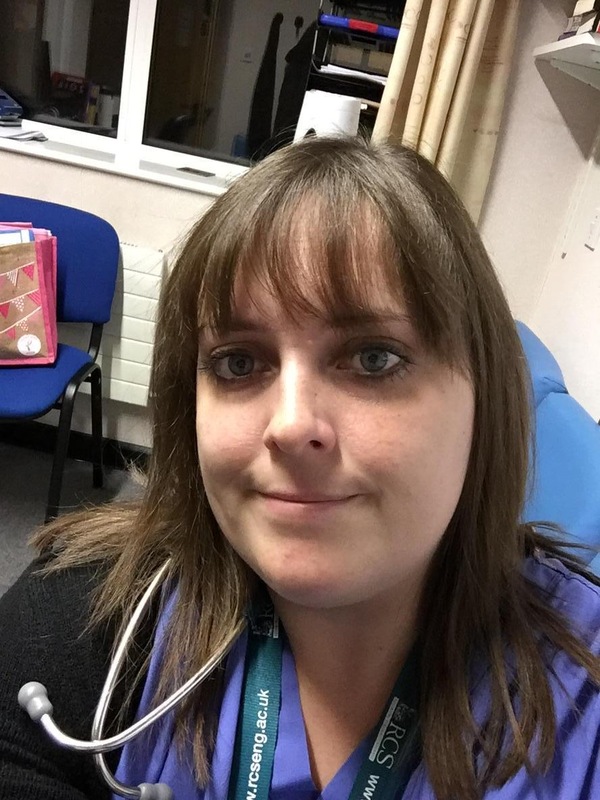 Alice’s elder sister, my elder daughter Emma, is a junior surgeon, a Senior House Officer in the Royal Glamorgan Hospital working for her MRCS qualification (she’s half-way there) which will enable her to apply for a Registrar’s post. She has two degrees, has published academic papers, and she is just entering her tenth year of study and training since she started at Bristol University. Emma will be very happy to take your, or your children’s, tonsils and adenoids out, or to fit grommets in their ears – all of which she does very well, every day of the week, including weekends. She’s at work now, right now, on Sunday morning. She often is. I’m not sure whether St Luke was a physician or a surgeon: whether he worked with drugs or other non-invasive therapies, or whether he wielded a scalpel. It’s interesting that, in the Gospel reading, (from St Luke), Jesus sends out his 70 or 72 missionaries in pairs, travelling very light; and after they have wished peace upon those whom they visit, they are told to heal the sick – which is something that St Luke, the doctor, reports without comment. I would be really interested to know what he thought about this healing. We have, even today, almost a parallel set of disciplines here: on the one hand you have the medical profession, that my daughters belong to, who practise medicine as a scientific discipline with drugs, with other non-invasive therapies, and with surgery. On the other hand you have healing ministries. In many churches – including St Andrew’s, our sister church – there is a healing ministry, where during the service, people are available to lay on hands and pray for people who feel they need God’s healing touch. Of course Jesus himself healed many people, even including raising people from the dead – Jairus’ daughter and Lazarus, who’d both definitely died. That must be the ultimate form of healing. There were also many other healing miracles: the blind man, that Jesus had to have two goes at healing; the man who had been lame from birth: ‘Take up thy bed, and walk’; the woman who had had a haemorrhage for 12 years – she touched his clothing, and it was enough for her to be healed; people who had ‘devils’ – what we perhaps would now characterise as a kind of psychiatric illness: in all these cases, Jesus didn’t use any drugs or psychiatric techniques or behavioural therapies – or surgery. Jesus did seem to approve of surgery. He said, If thy right hand offend thee, cut it off, and cast it from thee: for it is profitable for thee that one of thy members should perish, and not that thy whole body should be cast into hell. (Matt. 5:30). There are people who sincerely believe that one or other branch of healing, scientific, medical on the one hand, and faith-based on the other, should oust the other one entirely. A very important ministry in the church is our ministry as chaplains in hospital. On the whole our chaplains are not medically qualified – although some are. I know a very experienced hospital chaplain who started as a nurse. On the whole, everybody in the NHS believes that having hospital chaplains is a very good thing, simply from the point of view that it helps people to get better; it helps people to cope with the stresses and strains of being in hospital. You could almost say that hospital chaplaincy offers a kind of complementary therapy. What about today’s ‘beloved physician?’ What do we, as Christians, have to say about a situation where our beloved physicians feel that things are so wrong for them that they have to actually have a demonstration, in public outside Parliament? Jesus was pretty clear that someone who needs medical assistance should receive it. The Good Samaritan found the man who had been hurt and helped him. He didn’t ask to see his credit cards or the details of his insurance. He helped him because he was hurt. That is the principle of our National Health Service. The Health Service should be available to all, free at the point of need. I believe that Margaret Thatcher said that we should note that the Good Samaritan had the means to look after the poor man that he found injured on the road from Jerusalem to Jericho. He took him to an hotel, had them swipe his credit card, and undertook that he would be responsible for the cost of the injured man’s accommodation until he was better. That wouldn’t have been possible if the Good Samaritan had not had the wherewithal to do it. Actually I’m rather uneasy about the conclusion that Margaret Thatcher drew from that. When I go collecting for charities, particularly Christian Aid, it’s always easier to get money from the poorer roads. People who have less, tend to give disproportionately more of what they have, in charity. The National Health Service is, effectively, a collective charitable operation by all of us, paying through our taxes, so that everyone can receive medical treatment if they need it, irrespective of the cost of that treatment and the ability of the patient to pay for it. But it is very wrong, I think, for us who enjoy the benefits, at the same time to ask the professionals who actually deliver that medical care, the doctors and the nurses and the ancillary workers, to give their time and energy, and not have decent living conditions or proper salaries, because we, through our politicians, are not prepared to pay enough for what they do. I think that we should be brought up short – and I hope that our leaders are brought up short – by the sight of thousands of the cleverest, most dedicated and most highly qualified people in our society gathered outside Parliament and demonstrating against the conditions which the government is threatening to impose upon them: demonstrating not only that they are not being paid enough or given enough rest time, but that they are being forced by those conditions to deliver substandard or possibly dangerous care. If a doctor in this country wants to practise abroad, in Australia, Canada, South Africa, mainland Europe or the USA, or anywhere in the world, they usually require a certificate of competency which the Health Service has to provide on request. Applications for these certificates are now running at the highest level they have ever done since the Health Service began. We are losing doctors in significant numbers because they believe they can no longer practise in a way which is consistent with their Hippocratic oath and with the ability to have a decent life. Remember, the Good Samaritan had enough money, and so he was able, to help the injured man. The whole business of healing was obviously central to Jesus’s ministry. The son of God – God in man – didn’t want people to be ill. He healed people, and when he sent out the 70 or 72 as missionaries, they were medical missionaries. They were there to bring healing to sick people. I’m very proud of my two daughters – Dr Emma and Dr Alice. But I am deeply troubled that Dr Alice had to be in a demo yesterday and Dr Emma would have been there but for the fact, as she tweeted earlier in the week, that #IAmInWorkJeremy. I do pray that the politicians will start to realise that however expensive the mission of healing is, it is a cost that society, in the sixth richest country in the world, should meet gladly and in full. As we remember Saint Luke, the beloved physician, let us also remember, and give proper support for, our beloved physicians as well. You might wonder why our lesson just now was about the wedding at Cana in Galilee rather than Jesus’ visit from the Wise Men, given that this Sunday is our celebration of Epiphany; Epiphany, which means showing off, revealing. This morning indeed the Gospel was the story of the Wise Men: the last of the traditional Christmas stories. It’s the lesson for the twelfth day of Christmas. Our decorations are supposed to be taken down tonight, Twelfth Night. Christmas is over. The season of Epiphany begins. In the Epiphany season, next week we mark the baptism of Christ, and three weeks after that, the Presentation of Christ in the Temple, Candlemas – when we are going to have a special Evensong here at St Mary’s. In between, in a fortnight, on 19th January, there will be our Christingle service in the morning before Mattins, and – as this is another traditional Epiphany theme – there will be the annual Week of Prayer for Christian Unity service in the evening, at the Methodist chapel, instead of Evensong here. The candles, the Christingles and at Candlemas, are symbolic of the Epiphany light, the enlightenment, that the coming of God’s kingdom brings. ‘Arise, shine; for your light has come,’ says Isaiah in our first lesson. It is all about showing, showing to the world that Jesus is here. The wedding at Cana fits in with this. The evangelist says that Jesus turning the water into wine was his first miracle, ‘and he revealed his glory.’ Revealed, manifested. Epiphany. That’s all very familiar. Emmanuel, God with us. ‘O come, O come, Emmanuel’. But what does it really mean, mean to us today? Time was, when the idea of light, the idea of enlightening people, was seen differently. In the 17th and 18th centuries, the time of the Enlightenment with a capital E, it was the time of Erasmus and the Humanists. They believed that the world could be completely understood through the use of reason, reasoning and logic. That went for knowledge of God as well: whatever we could know about God, we could know only by the use of our intellect – the same way in which we learned about animals and geology and so on. It led some theologians and philosophers to look at the findings of scientific enquiry, like Darwin’s work on evolution, and to reach the conclusion that life on earth may have been started by God, but that we could not know much more about this God than that He is an ultimate first cause, a creator from nothing, an unmoved mover. Reason could take you to a belief in that rather limited god, the divine creator – but not much further. You could not know much about what such a god was like. Most importantly, there seemed to be no evidence that God had done anything more than just starting the process off. No evidence that God had any interest in human life, or in particular, that He cares for us. ‘He hath shewed strength with his arm: he hath scattered the proud in the imagination of their hearts. He hath put down the mighty from their seat: and hath exalted the humble and meek. That’s not a description of a laissez-faire god, of an unmoved mover who has, frankly, just moved on: it’s a description of an interventionist God, a God who cares for social justice. God with us. God with us, who does not stand idly by in the face of injustice, in the face of poverty and exploitation. Somebody like Richard Dawkins might say, the Magnificat is just pretty words. It doesn’t really mean anything. Science can’t lead you to believe in a God, or at least in a God who has any personal interest in us. At the time of the Enlightenment, in the 18th and early 19th centuries, the answer to the deists, as they were called – to the people who said that God was just the creator, a blind watchmaker, and nothing more – the answer was that our religion is revealed religion. There are things beyond what reason can tell us, things nevertheless revealed to us, revealed to us by God. One sort of revelation is the sort of thing which we are celebrating today. Turning the water into wine was a demonstration, an epiphany. Did it really happen? It can’t be proved. But one thing you can say is that if it did happen, then it was a complete contradiction of the idea that God has moved on, that He doesn’t care. If God has manifested Himself, has showed Himself to us, in the person of Jesus, then it can’t be true that He doesn’t care for us. Jesus is the Good Shepherd. He in turn calls on his flock to be good sheep. In the parable of the Good Samaritan, in Jesus’ new commandment, that we love one another, He calls on us to live like people who recognise that they have God in their midst, God with us, Emmanuel. It was, and still is, a revolutionary message. By turning the water into wine, by manifesting himself in his divine nature, Jesus was challenging the powers that be, both spiritual – the Pharisees and the scribes – and temporal, the Romans. They both had a vested interest in the established order – ‘the rich man in his castle, the poor man at his gate’. To upset it was dangerous. In the story of the Wise Men, Herod ‘was troubled, and all Jerusalem with him,’ when the Wise Men told him of the new king’s birth. Similarly today. Let’s not be too ‘political’, or upset the status quo, people say. Look at all those respectable people who say they are all right, they have no need to believe: there is nothing missing in their lives. They never say, like the bod in the Alpha Course poster, ‘Is that all there is?’ But they have no proper roots, no real understanding of what is good. Instead, they tend to cling to status and possessions. There is nothing else, for them, nothing else to cling on to. But a Christian has faith, a Christian has faith that there is more, there is a reality beyond what we can reach simply by the exercise of reason, excellent though that is. Our prayers are answered; we know we are not alone. It is reasonable, it makes sense, after all, for us to read the miracle stories, to open our minds to analogy, to metaphor, and to see God, revealed. The Lord is here: His Spirit is with us – but we mustn’t ignore Him. It must make a difference – we must change. That’s what Epiphany calls us to do. ‘He hath filled the hungry with good things: and the rich he hath sent empty away.’ Now what are we going to do?